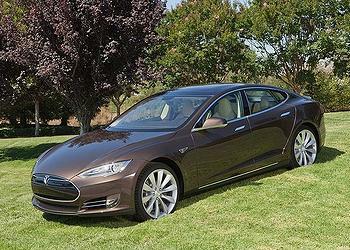 NEW YORK, New York, March 29, 2013 (ENS) – The Tesla Model S was named the 2013 World Green Car Thursday at a press conference hosted by the World Car Awards at the New York International Auto Show. A jury of 66 motoring journalists from 23 countries chose the Tesla and, calling it the “car for everyone,” they selected the Volkswagen Golf as the 2013 World Car of the Year. The Tesla Model S was chosen as the 2013 World Green Car from an initial entry list of 21 new vehicles from all over the world, then a short list of 10, then three finalists: the Tesla Model S, the Renault Zoe and the Volvo V60 Plug-in Hybrid. The World Green Car award is presented by Bridgestone Corporation of Japan. To be eligible for the award, a vehicle had to be all-new, or substantially revised, in production and introduced for sale or lease to the public in quantities of at least 10 in at least one major market during the period January 1, 2012 to May 30th, 2013. Tailpipe emissions, fuel consumption, and use of a major advanced power plant technology, aimed specifically at increasing the vehicle’s environmental responsibility, were all taken into consideration in determining the winner. Due to the complexity of some of the ‘green’ technologies, five specialized experts were appointed by the World Car Awards Steering Committee to review all documentation and specs associated with each candidate. They were asked to create a short-list of finalists for review by the 66 jurors in their second round of voting in February. Their ballots were then tabulated by the international accounting firm KPMG. Volkswagen, too, is moving to give eco-conscious drivers the kind of cars they will want. As he accepted the World Car of the Year award, VW’s Chairman of the Board said the Golf will soon be made as a plug-in hybrid and as a battery electric car. “We at Volkswagen are all delighted that the Golf has been named World Car of the Year,” said Prof. Dr. Martin Winterkorn, chairman of the Board of Management of Volkswagen Aktiengesellschaft. 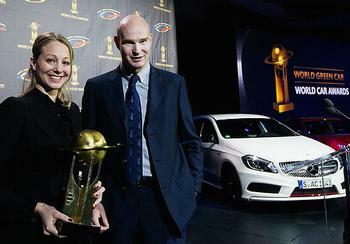 The Golf has won four World Car of the Year overall titles in five years and it is still on a winning streak. Just three weeks ago the compact car took European Car of the Year. The Golf is now sold in nearly 200 markets, but the North American debut is on hold as Volkswagen transfers production from Germany to a plant in Mexico. The award-winning seventh-generation Golf will go on sale in North American as a 2015 model. It will be built at Volkswagen’s factory in Puebla, Mexico. Also at the press conference a study conducted by Prime Research was released showing that downsizing and improved internal combustion engines are the top trend for 2014 and beyond. Lightweight technology is on the rise. Enthusiasm about the fully battery-electric vehicle is “further waning,” the Prime Research study found, while plug-in hybrid technology was seen as the most promising alternative powertrain technology. And safety-related driver assistance systems are a key topic, while skepticism prevails towards fully autonomous driving. “While connectivity and efficiency remain the most important topics for the top global motor journalists, e-mobility has dropped from third rank to number six out of ten in less than a year,” said Dr. Rainer Mathes, president of Prime Research, which conducted the study in conjunction with the World Car Awards. “The third position is now occupied by hybrid technology, previously ranked fourth,” he added. Mathes also noted that light-weight technology, which was considered of least performance in last year’s survey, has moved upwards from tenth to fifth rank – a clear sign of its growing significance.